Visitor attitudes and guest behavior are the focus of this tenth and last post of our special series on the key challenges preventing tourism businesses and destinations from becoming more sustainable. In our interviews with tourism sustainability professionals we often include a question about which they consider the main challenges regarding tourism sustainability. Among the many (and very diverse) answers so far, we’ve identified 10 themes and areas of concern. Visitor attitude and guest behavior are among those. Below three extracts and answers from our interviews, intended to offer you a snapshot of expert views on the topic. We strongly recommend you to read the full versions of the interviews. Sustainability challenges in tourism are very location-specific, and as such best understood in context. Looking back, which sustainability aspects do you find the most challenging when developing a remote island destination, such as Principe? “And then there’s the tourist who comes to Africa with the prospect of “poor thing” and who thinks that it will make a difference to hand out candy to children on the street because it makes them very happy. It is fundamental teaching that this behavior is wrong and has very serious social consequences: it stimulates begging among children, takes them to associate the tourist with getting something back, triggers fights among children for sweets and causes health problems. And, of course, the one who we find on the street is not necessary the one who need it the most. We encourage that the tourists bring donations, but that they be responsible, that is, bring the essentials (no candy), and deliver those to persons who can make a fair and equitable distribution. Clearly, the best sustainability strategy or technical solution doesn’t work if visitors and guests don’t (know how to) participate. Communication is essential and the best way to go about it is to tell stories and use a bit of humor. The last thing we want on our vacation is to be lectured by the ‘eco-police’. Throughout the last years we have featured many great examples of sustainability well communicated. Some of those are Landgut Stober near Berlin in Germany, Siloso Beach Resort in Singapore, and of course a must read on the topic is our interview with Professor Xavier Font of Surrey University, the ‘guru’ of sustainability marketing and communication. This concludes our special series on sustainability challenges in tourism. We hope you’ve enjoyed it and if you did, please share with your colleagues and friends. The information and views set out in this article are those of the authors (interviewees) and do not necessarily reflect the official opinion of the organizations they work for. 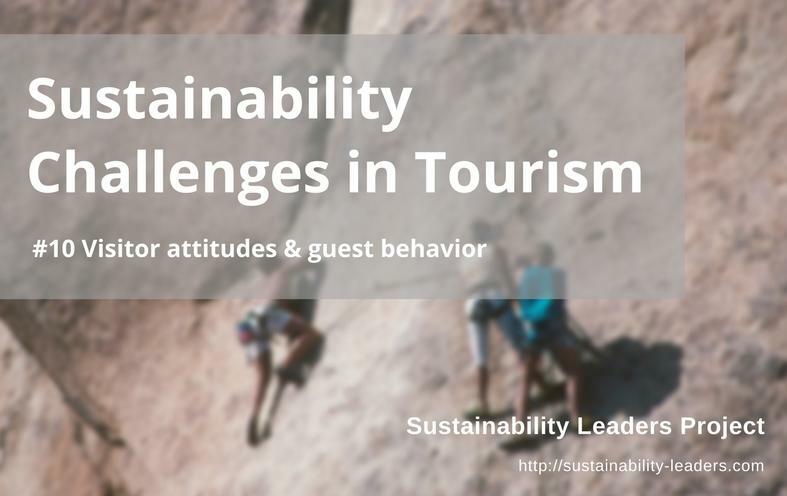 Enjoyed this snapshot of expert views on why visitor attitude and guest behavior constitute a key sustainability challenge for tourism businesses and destinations? Share and spread the word!